by Robert J. Martorana, Portfolio Manager at Right Blend Investing. o Weak Capex: At this stage in the economic cycle, capital spendingshould be contributing to broad-based growth. But only the energy sector is spending aggressively. o Weak banks: Bank lending should also be contributing, but lending is sluggish due to the aftermath of the crisis. So middle-market firms areturning to non-bank lenders. o Cash hoards: Firms in tech and healthcare are sitting on huge piles of cash but are not spending or acquiring. (This may be good or it may be bad: The firms are showing capital discipline, but are not contributing to a healthy ecosystem in their sectors or in the economy.) What would trigger spending? Lower valuations, better organic growth prospects, or a change in tax regimes to allow repatriation of cash held overseas. o Earnings Insight by John Butters (formerly of Thomson Reuters, where he did earnings research since 2000). John is also the author of the 2014 Earnings Outlook. o Cash and Investment Quarterly and the Dividend Quarterly, both written by Michael Amenta, CFA. o These reports are written by data maven Howard Silverblatt, who contributed additional material used in this article. 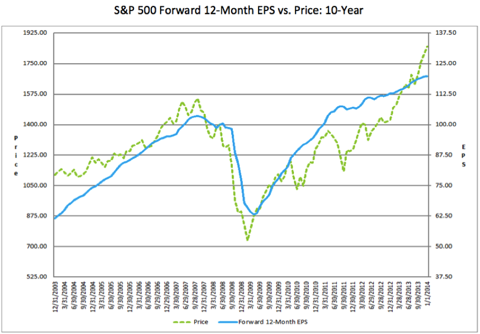 · Consensus range is tight: The 2014 top-down EPS estimate for the S&P 500 is $118.16 (by market strategists), while the bottom-up estimate is $119.81 (by industry analysts). This puts year-on-year EPS growth in 2014 at 10.5% with revenue growth at 4%. A tight range makes some folks nervous, and could be a sign of complacency. 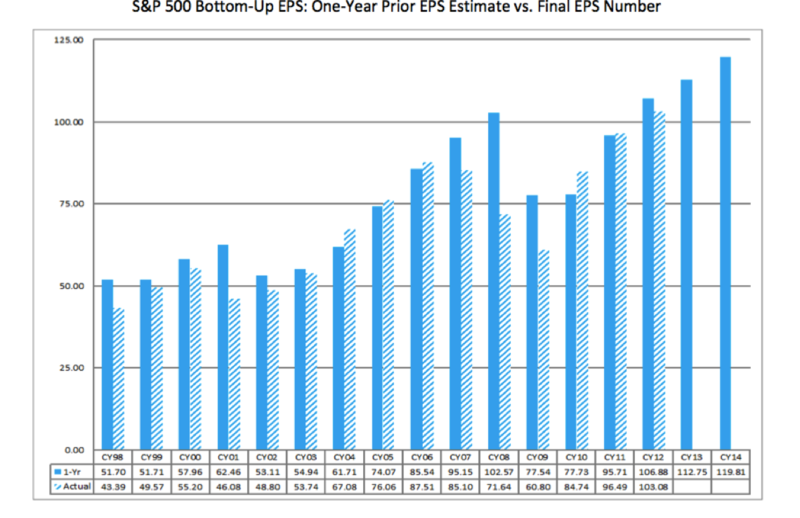 Earnings revisions in Q4 were neutral: Estimate cuts were about 4%, in line with historic averages. It is common for estimates to be trimmed in a rising market (see·Jan 3 report). Negative guidance in Q4 came from 97 companies, with positive guidance from 13. 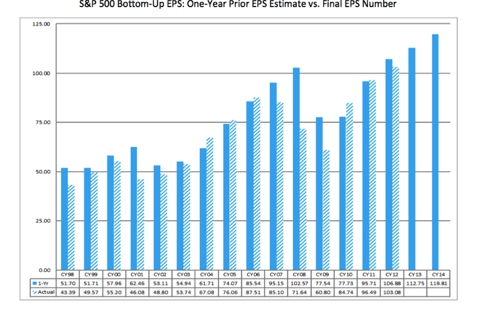 · Historic S&P Earnings: In the chart below, the solid bar shows projections for EPS 1-year in advance, and the striped bar shows the actual reported EPS. Conventional wisdom says that bottom-up estimates have an optimistic bias, but I believe that this is no longer true after Sarbanes Oxley and after adjusting for recessions. 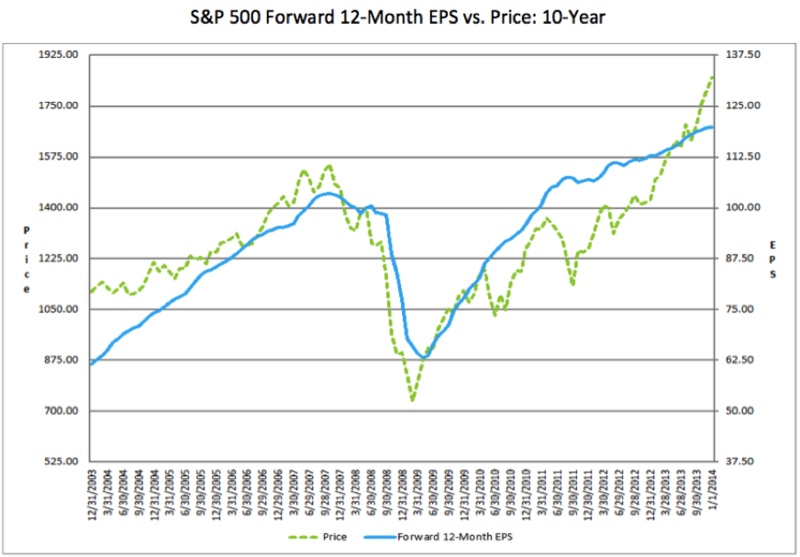 I base this on Jeff Miller’s excellent research on earnings optimism. Jeff challenges conventional wisdom that estimates from sell-side analysts are consistently high at the beginning of each calendar year. (Take a look-you won’t regret it). · Telecom: Verizon has a disproportionate impact on Telecom. Without Verizon, 4Q EPS growth drops from 14% to 6%. · Energy: Sector has 1% revenue growth in 2014, due partly to a 6% drop in revenues in refining/mktg. 4Q EPS to be down 8%, led by Exxon. Without Exxon, EPS down 5%. · Healthcare: Highest projected rev growth in 2014 at 6.4%. Sector has 4Q revenue growth of 4%, led by Biotech and HealthCare. 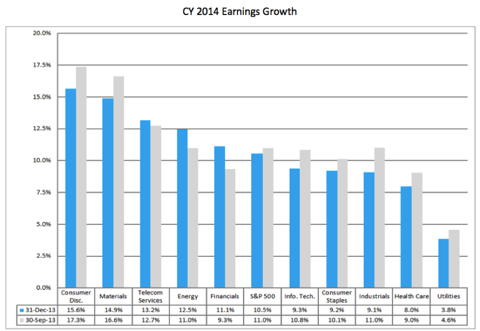 · Consumer Discretionary: 2014 revenue growth projected to be 6%. Internet and Catalog Retail up 22% in 4Q! MultiLine Retail to post slightly negative rev growth in 4Q. · Financials: This sector is driving 4Q earnings with 24% growth. Without financials S&P earnings growth in 4Q drops from 6% to 3%. Insurance earnings up 56% in 4Q (projected). o 4Q Revenue Drag from Prudential: Year-ago pension income boosted 4Q2013 by $35 billion (not a typo). Pru is depressing rev growth in financial sector by 10% and the entire S&P 500 by 0.6%. · Tech: Best revenue growth in 4Q at 4%, led by Internet/Software at 19%. o Forex Hurts Software EPS: The Yen is down 25% year-on-year, from 80/$ in 4Q 2012 to 100/$ in 4Q 2013. Oracle, Red Hat, and Adobe noted this in the 3Q. 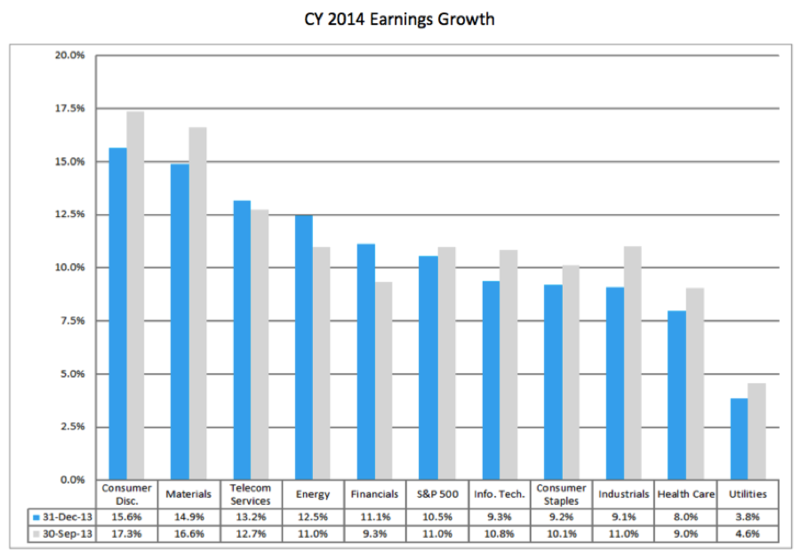 · Industrials: Sector has broad-based growth and modest expectations for 2014 EPS of 9%. 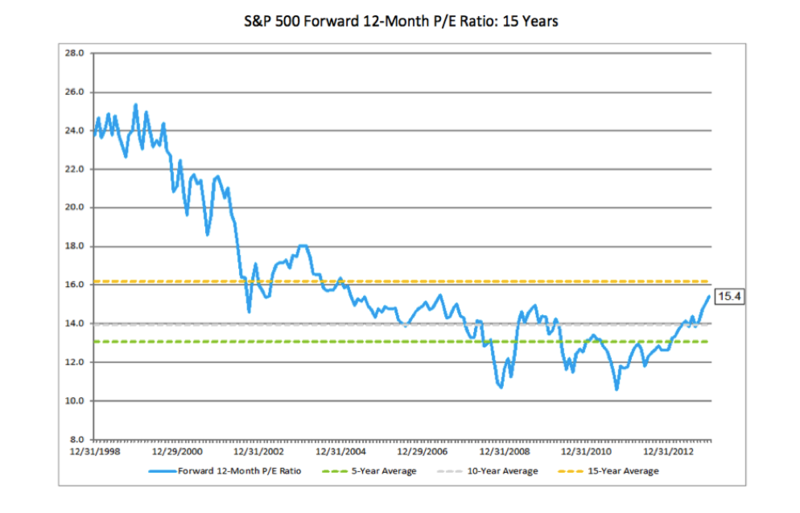 Current valuations are above historic trends, as shown in chart below. 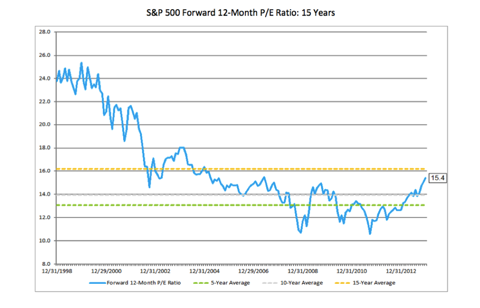 · P/E is based on closing price for S&P 500 on 12/31/13 of 1838.46. · Payout ratios are 36% for the S&P 500, below the historic average of 52%. 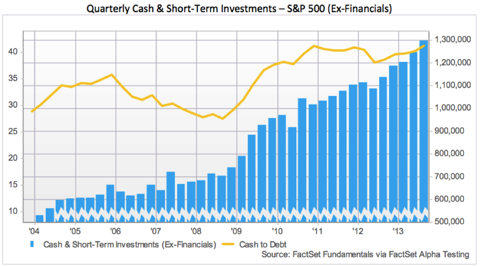 · Balance sheets also strong, with cash rising to over $1.3 trillion (see chart below). · Cash flows are strong, especially in tech and healthcare. 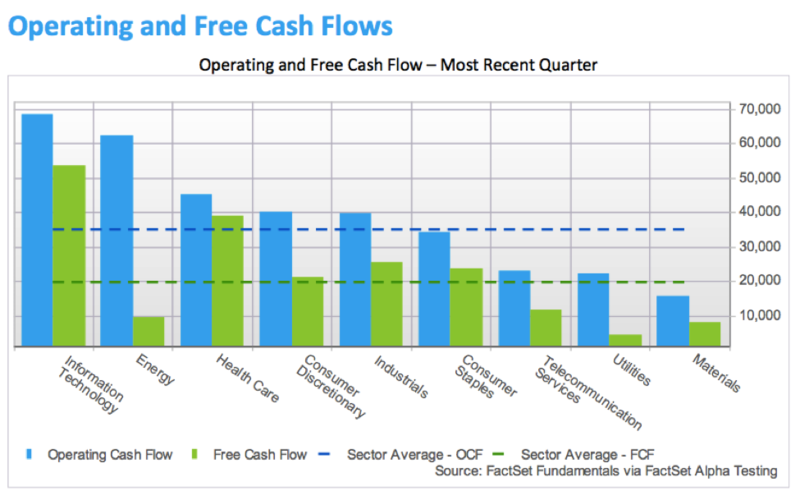 Capex is restrained (except in energy), leading to strong free cash flow generation in every sector except materials and health care. · Tech dividends accounted for 15% of 2013 dividends (more than utilities and telecom combined). · Financial dividends rose sharply in 2013, with 80 firms raising dividends and 2 decreasing dividends. The sector’s recovery from the crash is picking up steam. · Dividends account for 1/3 of total returns since 1989. Dividends accounted for all the returns in the telecom and utility sectors, and about half of returns in the materials and financial sectors. (click to enlarge) Tech and healthcare account for HALF of the cash in the S&P 500ex-financials. Tech cash rose 10% growth in 3Q and healthcare cash rose 23%. o Other firms in top 10: General Electric (GE) with $86B, Verizon (VZ) with $57B; Cisco (CSCO) with $48B, Ford (F) with $37B, Pfizer (PFE) with $33B and General Motors (GM) with $30B. Exxon Mobil (XOM) showing negative CF in 3Q . Energy is a high-capex industry and falling oil prices are hurting profits. 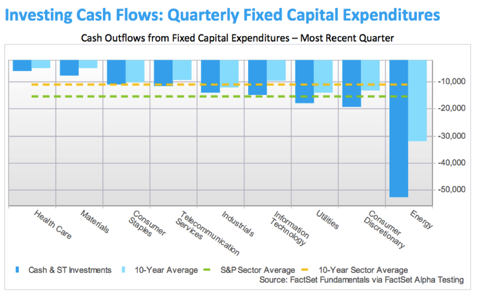 Energy accounts for 1/3 of all capex in S&P 500! XOM had negative $7.5 billion in cash flow during the third quarter. The reason is due to buybacks and dividends. XOM has had buybacks and dividends of $29 billion during the last 12 months, so it has heavy demands on its cash.